For some dumb reason I own two swing sets. Long story, but to sum up the reason… an impulse buy. Here is the short condensed version. I bought two adorable recycled horse tire swings about fifteen years. Way before I was a certified treehugger. So, don’t go thinking I bought them simply because they were recycled. They were adorable and in those days, if I thought my kids (ages 3 and 2 at the time) would love it, I would buy it. If Toys R Us had a gold level buyer, that would be me. Consumption at its best. After I bought my adorable tire swings, I realized I had nowhere to hang them. I did want to remove the bucket swings from my swing set. So, in my illogical mind, I bought another small swing set which had three more swings! Over the years, the extra swing set came in handy as my family grew from two kids to four kids. My orginal swing set only had 2 bucket swings. As time went on and my kids traded their swing for soccer balls and baseball bats, the swing sets stopped being used. I wasn’t complaining. The two swing sets had a good run of at least a decade or so. When we moved, I decided instead of hauling the little swing set to a new home, I would sell it. So, I listed in on Craig’s list, and no one bit. Not even a counter-offer. Zilch. I even offered it for free it to nursery schools. No one wanted it. Most people wanted a slide which this little swing set did not have. Even my new buyers of my house did not want. So, I had it taken apart and put back together at my new house, thinking perhaps someone would want it one day. Fast forward five years. The little swingset stands lonely with no one to play on it. (In fact the large set isn’t too happy either.) So, how do you re-use an old swing set? I wasn’t dismantling it and throwing it in a landfill. I have to admit all my best ideas usually come to me in the shower, except how to reuse my swing set. I can’t even take credit for it. One day, I was meeting with my landscaper and he eyed my swingset with the wavy yellow slide. “The slide would make a great water feature,” he explained. A lightening bolt came down and struck me in the head. I was planning on growing grapes anyways and needed an arbor for its vines. I researched and priced out my options and failed miserably to find a reasonable cost alternative. Since I am very into how to reuse “stuff,” these days, using my swing set as my grape arbor would be perfect! How cool would that be? Can’t you just see it? Grapes floating across and hanging through the rails that my kids use to climb across? So, where is my swing set now? Right at the front of my garden with a grape plant on either side. And you can’t believe who is climbing the swing set’s’ side rails now. My youngest who is 11. If my swing set could smile, it would. I am even considering hanging flower baskets from where the swings used to hang. One thing I noticed is that I will probably have to put some wire in between the rungs. 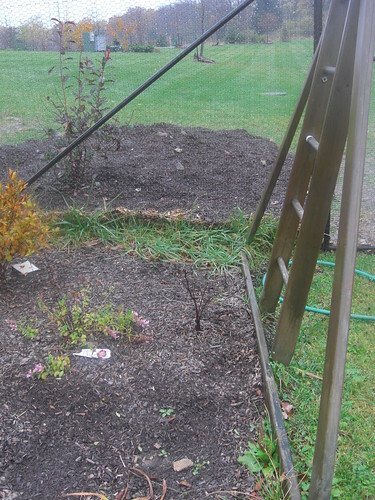 The rungs seem a little too spaced apart for the grapes to climb right now. But heck, you don’t have to plant grapes to reuse your swing set. You can plant clementis, wisteria, climbing roses, or any other type of climbing plant. 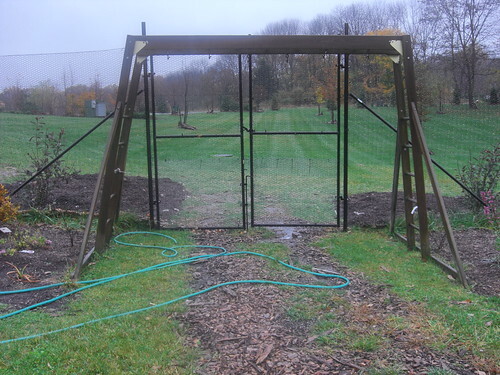 Now, I am eying the other swing set for kiwis and maybe figure out how to put in that water feature…. What ideas do you have to reuse your swing set? What would you plant near your swing set? Have you reused your swing set? Give us the skinny on anything else you reused? how about re-using those old swings? By the way, check out a bunch of my posts of how to reuse common every day items. My favorite has to be reusing your credit cards …or maybe your pantyhose. Or wait, reusing your own broken screens. Share yours or send me a picture with a short story so I can post it! I can’t have a swingset in my yard because of my HOA rules. That’s fine my back yard is too small anyway. If I had to come up with a use for a swing set I’d remove the kids swings and attach a porch swing to to it. .-= Condo Blues´s last blog ..Blitzkrieg’s Balloon Boy Costume! =-. Fantastic! You have a very creative mind. I had a swing set for my kids when they were little. They loved it and really wore it out. When we were getting ready to move, I thought we’d leave it for the new owners since the kids were bigger. You would have thought that I suggested leaving the family dog. So, sure enough, I had to disassemble then reassemble at the new house. .-= Tom M´s last blog ..Do Follow Blog, Comment Luv Keyword Luv =-. Super, Great thinking. For sandpit, it is easy to convert into flowerbed or something else, and it is totally different story for swing set. I like creative stuff, and you are really good at it. Awesome use for an old swing set. I literally laughed out loud when I read the part about your best ideas coming to you in the shower. I’m not alone! Great article, thanks. I wondered about possibly using the base to hang a hammock. I have a patio swing base and I am contemplating how that would turn out. I never thought of this. Great idea.